Thalwil, Switzerland–based u-blox announced the release of its u-blox 8 GPS/GLONASS receiver platform today (January 6, 2016). The new product complements the u-blox GNSS platform portfolio by addressing power-sensitive usage for battery-powered devices such as wearables and sports-training monitors. The existing u-blox M8 platform will continue to address applications where navigation performance and highest accuracy are paramount, according to the company. u-blox 8 offers significant improvements, compared with its predecessor u-blox 7. The tracking sensitivity has been increased by four dBm and is now –166 dBm. Enhanced odometer functionality, a new geofencing feature, and optimized preset power-save modes can halve the power requirements for sport products, the company said. Free-of-charge AssistNow for boosting GNSS acquisition performance, which is available online, offline, or as an autonomous service, has been improved, according to u-blox. "Nowadays many portable applications rely on a single coin battery; hence, low power-spending is crucial. 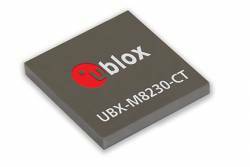 u-blox 8 has been developed for wearables and tracking applications, keeping in mind the need for low power consumption without compromising performance," says Uffe Pless, Product Marketing, Positioning, at u-blox. u-blox 8 is pin-compatible with the previous generation platform, u-blox 7. It will be available as a chip and as modules in several form factors. Customer samples of u-blox 8 chips and modules will be available by Q2 2016.